Indicators and metric systems are crucial tools in efforts to reach societal objectives, and these sys­tems are being employed increasingly in initiatives to improve the environmental, economic, and social sustainability of agri-food systems. Indicators can help clarify values and objectives, providing assessment criteria useful for tracking movement toward or away from targets. Unfortunately, the application of indicators and metrics to agricultural systems has been hindered by conflicting defini­tions of agricultural sustainability and pro­gress, leading to metrics that lack a holistic con­sideration of social, economic, and environmental factors. To address this shortcoming, we argue for a definition of progressive agriculture that includes all three of the abovementioned factors, stressing the need for multidimensional improvements in the impact of agri-food systems. Our proposed Progressive Agri­culture Index (PAI) integrates data from the U.S. Census of Agriculture, the U.S. Census, and other databases to assess nine vari­ables at the county level for the contiguous United States. Including data from both 2007 and 2012 permits analysis of time trends along with regional and county-level trends in individual and aggregate measures of progressivity. By ranking counties within their Farm Resource Regions (as defined by the U.S. Department of Agriculture [USDA] Eco­nomic Research Service [ERS]), as well as within their Urban Influence Categories, the PAI also makes it possible to compare counties with similar socio-economic and environmental contexts. 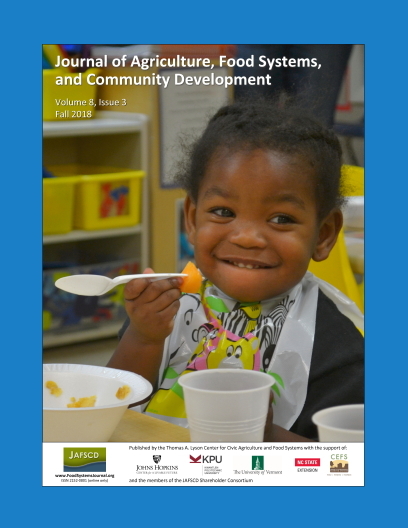 Given the important goal of improving social, economic, and environmental conditions in con­cert, we present this index to draw attention back to the often-neglected social facets of progressivity and thus contribute to advancing more integrated, participa­tory approaches to measuring progress in agri-food systems.